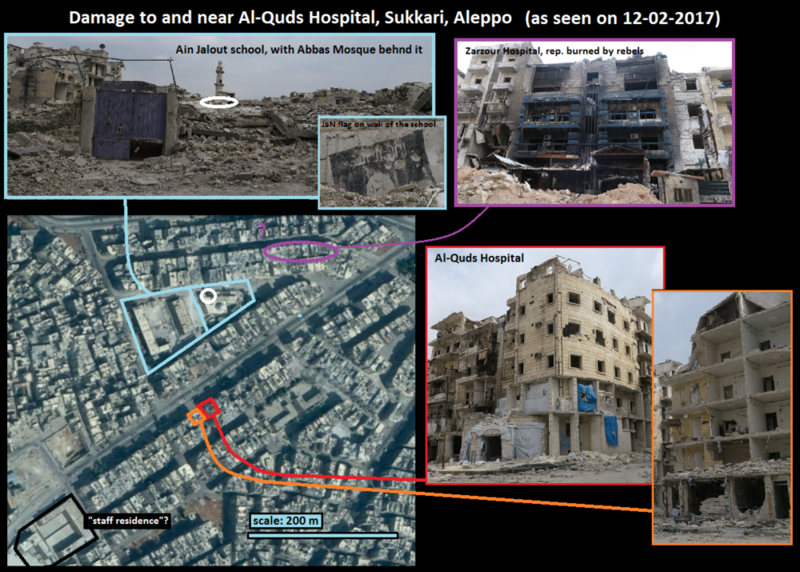 Al-Quds hospital was a medical facility in the opposition-held Sukkari district of Aleppo supported by Médecins Sans Frontières (MSF), managed by a Dr. Hamza al-Khatib, who was still there in mid-December, 2016, just days before full government re-conquest. (Amanpour, video) Al-Quds hospital (meaning Jerusalem in Arabic) was famously reported as destroyed by government airstrikes on the night of April 27, 2016. 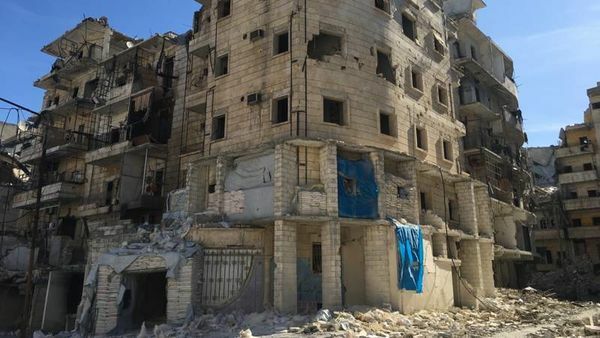 All evidence is clear the building suffered no serious external damage, and was certainly not "reduced to rubble" as MSF initially claimed (they later acknowledge it was operating again after 20 days). Just how an alleged 55 people were killed remains unclear. Sukkari district on Wikimapia, on the southwest edge of rebel-held east Aleppo. Al-Quds on Wikimapia. By this, it's on the dividing line between Sukkari and al-Ansari Mashhad district to the northwest. According to the #Aleppo Doctor's Report below, the hospital operation for the newsworthy one was moved to a different building deeper in the al-Ansari Mashhad district (unclear when but prior to November, 2016), using the same name in the new location. This, and the other Al-Quds hospital(s) in the area should be considered in reports from Al-Quds Hospital after it alleged destruction in April. June 2014 - Gun fire /Kidnapping: A member of an armed group arrived to the hospital and demanded a service that was unavailable at the time. Angered by the refusal of service, the member of the armed group fired shots in the hospital and kidnapped a member of the staff. 1 hospital staff member killed and 1 kidnapped. In response, the hospital suspended all activities, except for the emergency room (ER), until the kidnapped staff member was returned and a truce was reached with the armed group. In solidarity with Al Quds, all East Aleppo’s medical facilities suspended services, except the ER, to send a message of their independence from non-state armed groups. July 2015 - Barrel Bomb - A barrel bomb fell an estimated 15 meters away from the hospital. Minor damage to the hospital, including broken doors and windows, as well as damage to the outer walls. No casualties. 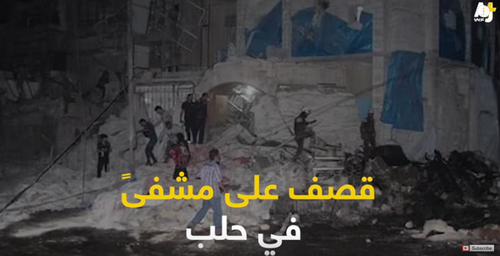 August 2015 - Barrel Bomb - A barrel bomb fell on a building close to the hospital, causing it to collapse. Debris from the collapsed building fell onto the hospital. Damage to medical equipment, the pharmacy stock and water and electricity systems. The hospital closed for one week to repair the damage. By this, the deadliest prior incident was one killed as one was kidnapped by a terrorist, who apparently wasn't even a lone nut, but had his unnamed group behind him. Two other cases are damage from nearby hits, with no deaths or injuries noted. Also note, this top floor may have never been complete or roofed over. 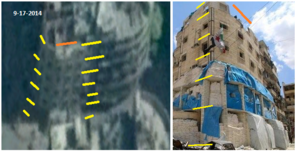 The video "The Truth About Al Quds Hospital in Aleppo" (part 1) argues it was just raised walls with no full roof, with some limited space possibly made. In all views, it appears that upper floor is just walls, casting their own shadow with no roof to hide it. 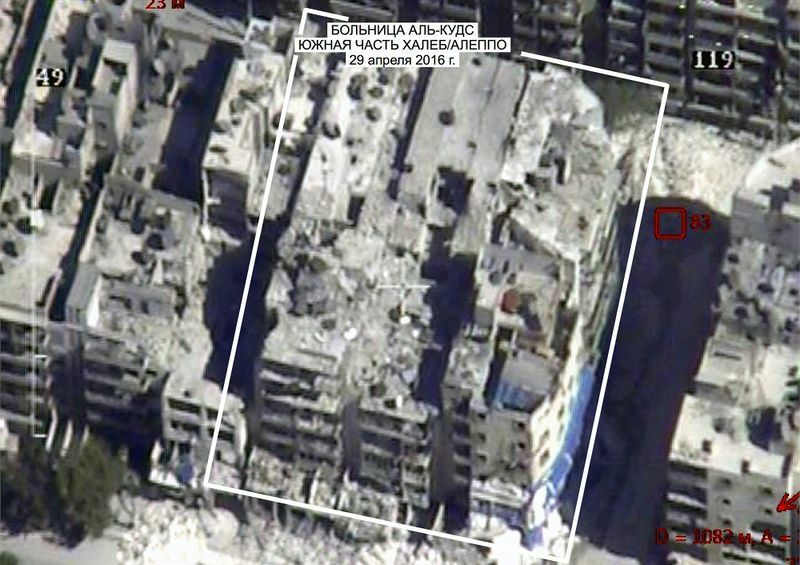 It looks like there was a blue tarp structure at the front, where there's now just a frame, but only after the satellite image used here (it appears in December, 2014, and is still there December 2015). On April 27, 2016, the clinic was reportedly attacked and destroyed by a government air strike using a barrel bomb, killing dozens. A later report from Médecins Sans Frontières gives more detail: Review of Attack on Al Quds hospital in Aleppo City (executive summary with report PDF link) Published on 30 Sep 2016 (via ReliefWeb) "According to interviews with staff present at Al Quds hospital during the attack," there were 4 attacks in the area that night. "at exactly 9.37pm, a building across from the hospital, identified as Ain Jalout school, was struck by an airstrike." As the executive summary notes: "Al Quds re-opened 20 days after the attack, but not all services were activated and capacities were greatly limited given that (a) two operational floors were destroyed," staff killed, and equipment lost. But by then they weren't claiming the hospital had been "reduced to rubble." However, they note a full body count "was hindered by the difficulty of recovering bodies from deep under the rubble caused by the attack." There apparently is no deep rubble, but the early death toll was too low, MSF later heard. "According to Al Quds management, as of 4 May the total death toll of the 27 April attack on Al Quds hospital was 55. The dead included 6 Al Quds staff, namely 1 pediatrician, 1 dentist, 2 nurses, 1 technician and 1 guard. Eight of the hospital staff were also seriously injured. The pediatrician and dentist killed were said to be among the last medical specialists left in East Aleppo after five years of war. Approximately 80 people were injured." 55 people is a lot to have died. The VDC only seems to list 25. All from Aleppo, Sukkari district, killed 4-27 to 5-4 by warplane shelling = 25 total, all listed as civilians: 19 dated on 4-27, 5 dated (maybe found) on 4-28, none later. There's no note of this being connected to a hospital attack, but it's very like the original reports of 27 killed, including 3 children. The 25 include one woman (listed as non-civilian, maybe in error, possible medical staff), 3 boys, no girls, and 21 men. 3 men are named Nonou, 3 are unidentified. For good measure, here's the main door as seen from outside. And a fuller view from another video. This does suggest serious injuries inside - a woman (the black shapes) is seen carrying a smaller, bloody person, out the intact doorway, and down this pile of external rubble. A daylight photo like Sterling looked at (right) shows a damaged vehicle, evidencing perhaps a blast from the right of the camera - fresh sandbags are placed against the outer walls and on ledges – possibly damaged, but intact enough to stack sandbags against and on, and no serious damage to the bricks can be seen seen at the exposed edges. "a building across from the hospital, identified as Ain Jalout school" was across a street, a block, and another street. Its proximity doesn't matter. "the Al Quds staff residence, located a few buildings down from the hospital" remains unclear. "a third strike assaulted the entrance of the hospital’s emergency room" Is this external? The entrance we see? As noted, it seems barely damaged by something unclear, unlikely to kill anyone. Later on it looks no worse. The main entrance leads into a long hall, with the emergency resume presumably some ways in. The entrance to it would be well inside the hospital. So this remains unclear. "a fourth strike hit the hospital, strongly impacting the emergency room and destroying the two top floors." Again, where is this emergency room? Is it on an upper floor? Or did this fourth strike include two hits, one to the unplaced emergency room, and another to the upper floors? It's not clear how many floors the place originally had. Currently, we see 6, with the top one seeming to have its roof sheared off. However as noted above, the roof was apparently never there, and some of the damage to these flimsy outer walls was already there perhaps in September, 2014. Older satellite imagery suggests it had six levels to start with (see Google Earth, 9-17-2014), but only five roofs. There may be fresh damage, and whatever was up there (a vegetable garden?) was likely destroyed. The floor beneath it might have suffered some damage as well, depending what the blast was caused by. But this Russian aerial view from two days later shows the damage to the roof can't be much. No external face of this place - front, side, or top - seems pierced or damaged at all. True grief, or ticklish acting? Could the story be entirely false? Consider the man seen at right, from the NYT video, claiming his family died. He seems to start laughing at his own extreme acting at the end, unable to wipe off the smile before the next video edit. There's a fine line between a smile and a grimace of pain, but he may be on the wrong side of it. This can't be proven either way, but the reader can make their own call. Other aspects of the alleged third and fourth strikes remain very muddled and apparently illogical. There was a blast seen on video, and how this connects is explored, for now, on the talk page. MSF has reported the hospital was operational again, with repairs, within 20 days of the April incident. 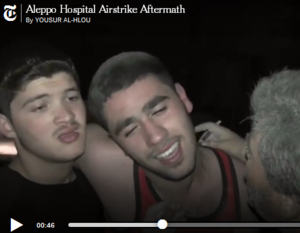 A Channel 4 News video oposted June 8, 2016, Inside Aleppo: three brothers at Al-Quds hospital clearly shows the same place, as the backdrop for a story where a young boy dies of a small, rectangular hole in his right temple, as his two similarly-aged but different-looking brothers, in similar dust coating, weep for the cameras. The aircraft responsible might be Syrian or Russian, they weren't sure yet. 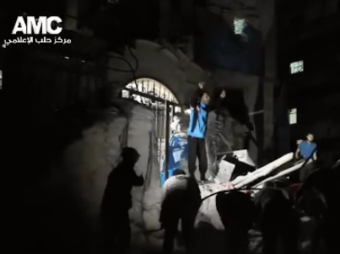 Director Dr. Hamza al-Khatib is seen at 1:17 overseeing the desperate efforts to save the boy. The #Aleppo Doctor's Report mentions that by November, 2016, Al-Quds hospital had moved out of this controversial building to a new location a little north. It retained the name and stationery, and presumably the management. Just when and why it moved isn't clear. It's apparently in this new locale that al-Quds became "Aleppo's last hospital" for this early December report from Vice News. So it may or may not be the same Al-Quds hospital “reduced to rubble” in April that was treating victims of an alleged government chlorine attack in August, with director al-Khatib speaking, (see Alleged Chemical Attack, August 10, 2016) and doing the same on September 6. Either way, reports of its total destruction were apparently exaggerated. August `14, 2016: The MSF report says Al Quds Hospital was Damaged this day, not clear how, "shortly after receiving MSF shipment of medical supplies." Hospital Al Zarzour was damaged the same day. The graphic relaying these and other attacks in July-August notes "All attacks that damaged hospitals have been confirmed by different sources, except those on 14 August which were confirmed by hospital management." 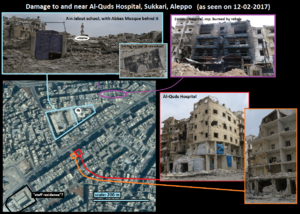 Ten months after the alleged April destruction, al-Quds hospital was still standing in February, 2017, after the government's complete re-conquest of eastern Aleppo. Duth journalist Sander van Hoorn went and saw it. We stop in a place where no stone was in place. People have to clamber over piles of debris to reach a UN well or a place where the Russians distributes bread. This is also the site of Al Quds hospital. Just last week, a report from an American think tank showed with a convincing reconstruction how it was to directly bombed several times . (note: this may refer to a recent MSF report on a different facility they claim was attacked in Idlib, in February. See ACLOS-related analysis here. If you stand, you see that it is one of the few buildings in the area that is relatively unscathed. Houses all around - collapsed upper floors, washed away facades, living rooms which are half visible - were hit. But the hospital was not. Also inside you can not see the damage that you would expect from a direct attack. What we saw on the images from the cameras in the hospital, were likely attacks to nearby targets. It does not make it less terrible and the hospital there became unusable. But a direct hit at this hospital did not happen, in my opinion. 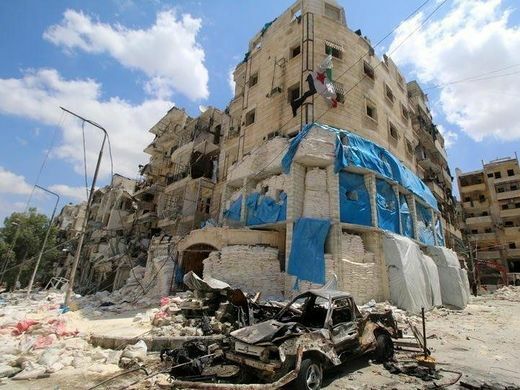 ACLOS adds a report from one of the many doctors still in Aleppo (and now able to threat patients in the entire city), after a visit to the area in recent days. Asking for anonymity, the "Aleppo doctor" provided an account and several photos and videos to activists, who have shared them with ACLOS. These will be at least partially uploaded and shared here. I went Sunday February 12, 2017 visiting the Ansari-Sukari neighborhood in order to see Zarzour and Al Quds Hospitals. My guide was a young man who lived there and knows very well the area. My first stop was Zarzour hospital (mentioned in MSF report) and I found out that it was burned. My guide told me that the rebels burned it the day before the evacuation (information confirmed by a high position responsible in the Syrian Red Crescent). On the side walk, I found hundreds of burned new blood bags (for collection of blood donation). A man met there invited me to visit his building just next to the hospital. His building was also burned and on the floors, I found hundreds of IV solution bags. Then, we moved to Ain Jalout school (mentioned in the report (see the rudimentary map drawn by me). In fact, there are 3 contiguous schools. Two are completely destroyed. One is partially. Behind the schools, there is a mosque called Abbas mosque with its minaret. Answering my surprise to see schools destroyed by air strikes, my guide told me that the mosque was one of the headquarter of the rebels and one school was an ammunition depot and the other one was a food depot. I noticed the flag of Al Nosra (Jabhat al-Nusra) painted on the external wall of the school, and dozens of buildings in the surrounding partially destroyed. Then, we moved to see Al Quds Hospital. Obviously, it is the most preserved building of the street. Obviously, it was not hit directly by bombs and probably received some fragments from bombs fallen on other building. I asked my guide if any restoration or repair were done. He said no. My feeling is the following: Ain Jalout school was the target of the strikes, the surrounding destroyed buildings were collateral damage (note: hit secondarily, on accident) and Al Quds hospital was not directly hit by strikes. I don’t agree with MSF conclusion that it was deliberate targeted. Of special interest, perhaps, is a "cannon" the doctor photographed parked under an awning near the hospital (around 50 meters away, he thought). The Aleppo Doctor's hand-drawn map (rotated so the lower left corner is approximately north, and the 500 meters estimate along the bottom here seems high). (note: Wikimapia agrees on Ain Jalout and Al-Quds, but the location of Zarzour is unclear (that block doesn't even run 500 meters, and it's not labeled on Wikimapia, so its presumed area is indicated. P.S.1 - I have a patient who comes to see me every few months and who were living in the Ansari neighborhood (controlled by the rebels). By chance, he came to my office on Monday February 13 after an absence of many months. He told me that in last November, he was admitted to a hospital there and give me the discharge report. It was from Al Quds Hospital as you can see on the photos. As I expressed my astonishment (false) about the hospital, being told that it was destroyed, he answered that the hospital is intact but following bombing and strikes on its area, they moved the hospital (equipment, beds, lab etc.…) to another building located in the neighborhood of Mashhad, few hundred meters away from the original location. And it is in this new location that my patient was admitted in November. P.S.2 - I had the opportunity to visit the basement of Ibn Rushed public hospital in West Aleppo guided by the director of Aleppo Health Direction. In this basement, very large, 1000 square meter, they put some of the medicine and equipment found in clinics and hospitals of the neighborhood controlled by the terrorists. See photos. These demonstrate clearly that there was no shortage of medicine as they proclaimed, via their godfathers, asking for a humanitarian truce. EAST ALEPPO: INSIDE AL QUDS HOSPITAL, IED EXPLOSION IN SUKARE Video compilation of images by Vanessa Beeley, Feb. 12, 2017, outside and inside the intact hospital, ground floor and basement, - and an IED explosion happens just a few blocks away as she's filming. Around 10:00 in the video, speaking with a dust-covered man - he says he (or someone) was checking on his house, after an absence, and something exploded. That's apparently a non-cleared booby-trap. Many people were injured, he says. This page was last edited on 8 October 2017, at 02:38.